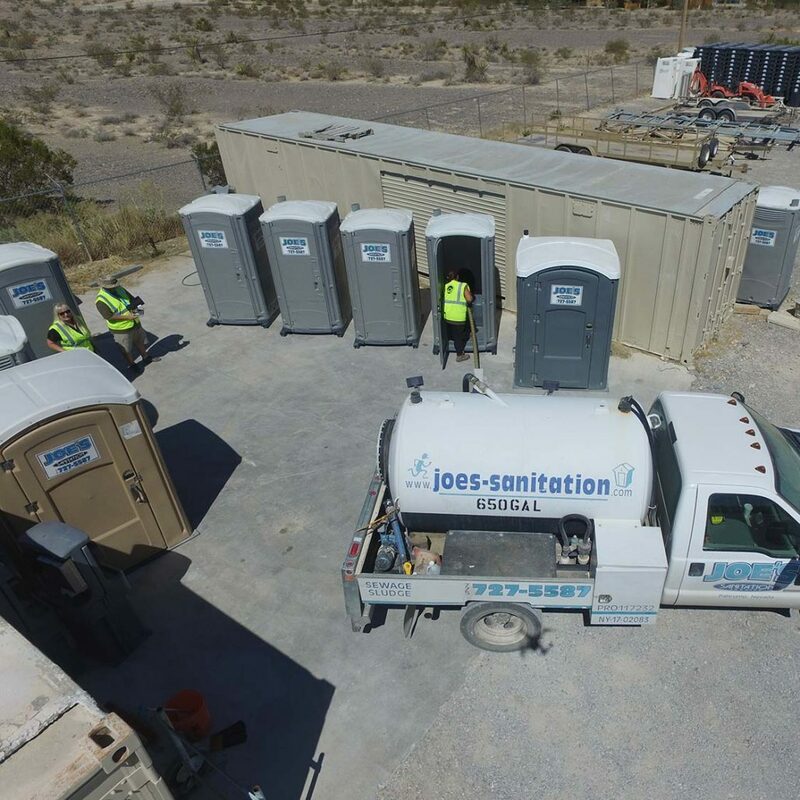 Joe’s Sanitation is a leading provider of portable restrooms for events, construction, and long-term rentals throughout Southern Nevada. We provide the most up to date equipment, matched by excellent service. We offer free event planning and consultation and we work hard to meet and exceed the service needs of our customers. 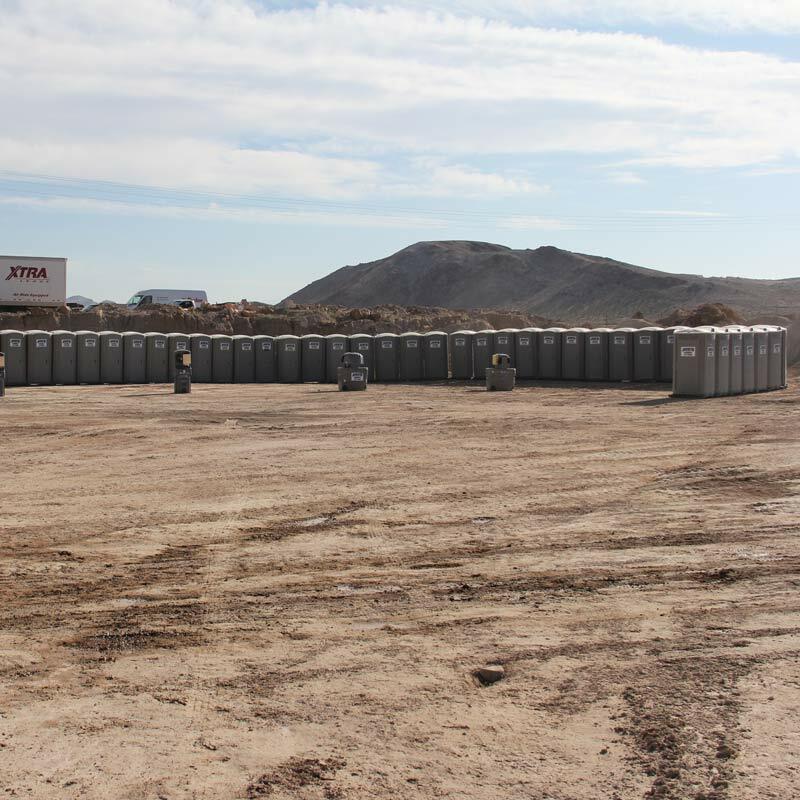 Whether you are planning a wedding, managing a corporate event or starting a construction project, we have the knowledge and experience to handle all your portable restroom needs. We are here to serve you 7 days a week, 24 hours a day. The standard toilet is our most basic unit. This unit is most popularly used for long-term rental, events anticipating hundreds to thousands of attendees, and construction projects. Trailer mounted units are also available. Amenities include roomy interior, anti-slip floor, ventilation, a purse/coat hook, and an occupancy latch. The Deluxe toilet is similar in style and dimension to our Standard toilet with the addition of flushing capabilities and a foot pump sink inside. This unit is well suited for a wide array of events as well as semi-permanent placement (parks, sporting events, or campgrounds), most often used long-term, or for small parties, weddings, and construction projects. These trailer mounted units are solar powered, do not require outside utilities, and are completely self-contained. Amenities include in-unit freshwater sinks with hands-free foot pumps, soap and towel dispensers, disposable seat covers, and a purse/coat hook. The ADA Accessible toilet is a larger unit designed to meet all ADA compliance requirements with adequate wheel chair turning space. Our ADA Handicap toilets meet California ADA requirements as well. These units are rented for long-term use, events, weddings, and construction projects. They are spacious for users with special requirements and parents assisting children. Amenities include flat doorsills, extra wide doors to accommodate wheelchairs, spacious interiors, a purse/coat hook, and handrail supports. Joe’s Executive/Luxury trailers are lavishly equipped and decorated to provide you and your guests with all of the comforts of a traditional stationary restroom. Ranging in size and functionality, these luxury trailer units are ideal for even the most formal gatherings. These units offer individual stalls, freshwater flush toilets, interior sinks with hot and cold running water, porcelain fixtures, finished trim, skylights, lighting, air conditioning/heating, mirrors, vanities, waste receptacles and built in stereo systems. The Handwash Station is a free standing unit with two sinks basins, dual spigots, soap dispensers, and paper towel dispensers in each unit. The Handwash Station contains a 24-gallon fresh water reservoir. Each unit is foot pump activated. Handwash Stations are often rented for long term use, events, and construction projects. Handwash Stations are also rented in order to meet local Health Department requirements. Holding tanks are ideal for large waste storage needs and sites that do not have access to running water. We offer a wide range of polyethylene holding tanks for both waste and fresh water applications. Storage containers are ideal for storing materials at construction sites and other work environments. These containers are also well suited to store athletic equipment and materials used at recreational sites. They are lockable, constructed of steel, and come in a variety of sizes. They are available for rental for any length of time that may be needed. 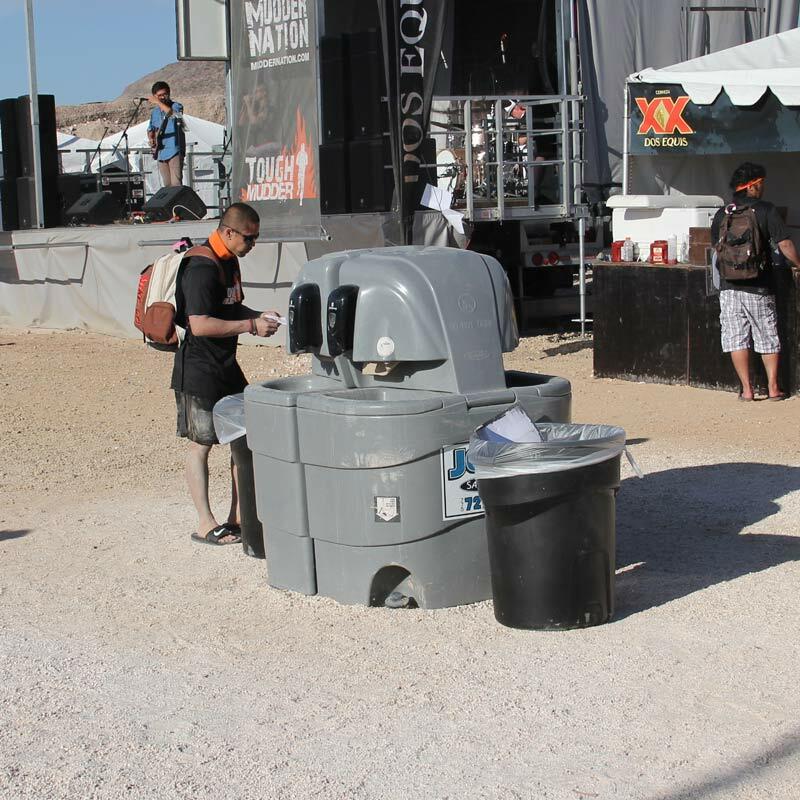 Our mini dog waste stations come in handy at any pet friendly event or location. These stations provide waste disposal bags make it easy to clean up after pets. 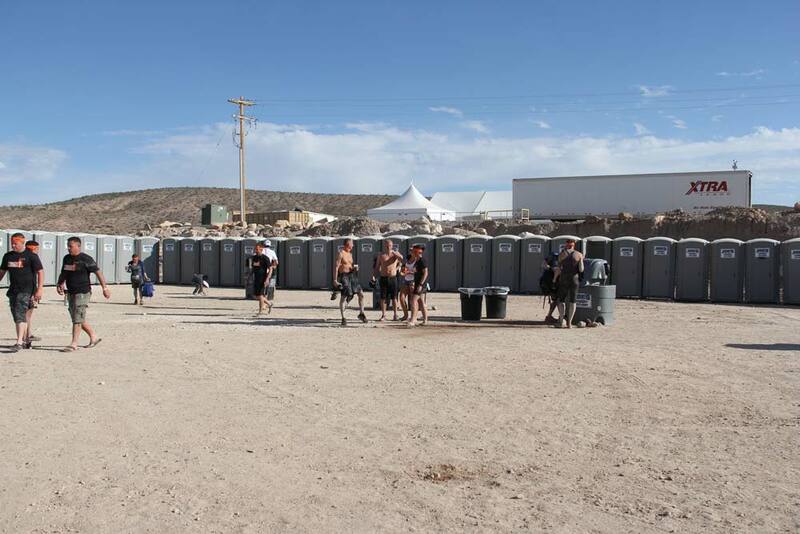 Clean, portable restrooms are an important part of an event experience. If planned properly, guests will never remember the facilities. Joe’s Sanitation wants your guests to remember your event for all the right reasons. 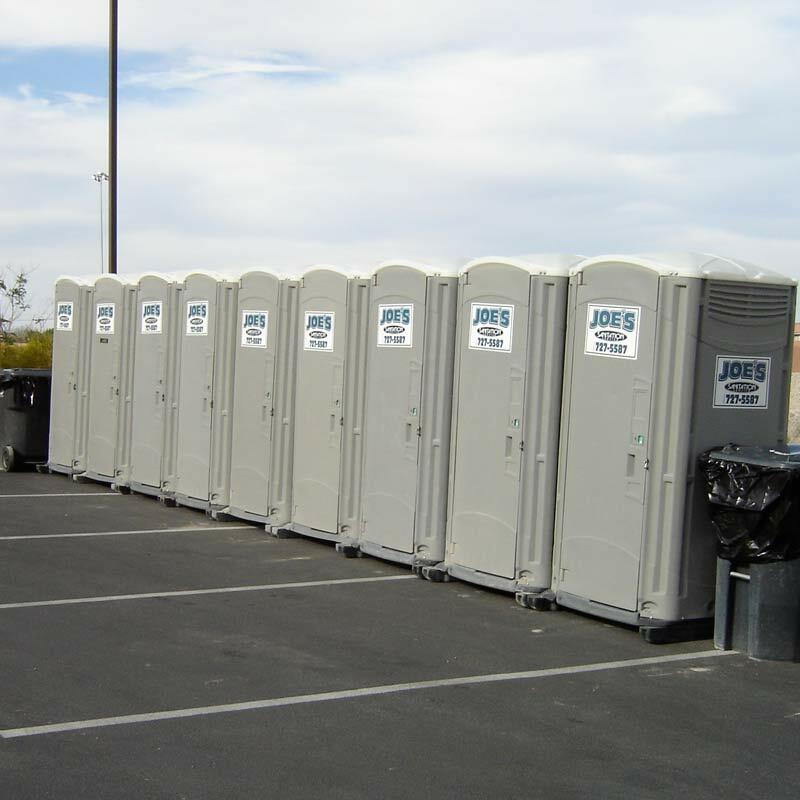 No matter how large or small your event, Joe’s Sanitation has the experience and tools available to help ensure your event is a success. For assistance in planning an event, or if you are interested in our luxury restrooms and/or trailer units, please contact our office to speak with a Special Events Coordinator. Joe’s Sanitation’s Special Events Coordinators are available to visit your site and help design solutions to make sure your event is trouble free. They can help you determine the number and type of restrooms needed for your event, advise you on the amount of services required, and work to select the best onsite placement for our restrooms and restroom trailers. Our Special Events Coordinators have experience in coordinating toilets for weddings, winery events, small and large parties, festivals, parades, and sporting events. Several factors may influence your needs, such as expected attendance, whether food and beverages will be served, and the hours of operation/duration of an event. If portable units are to be on-site for more than a day, it is important to schedule appropriate intervals for the units to be thoroughly cleaned and re-stocked with supplies. This assures that units are constantly pleasant and comfortable. A number of factors will determine the optimum location of portable restrooms and sanitation equipment. These factors include lighting, access paths, traffic flow, distance from food services, and wind direction.